DONETSK, Ukraine -- Standing at the village polling station where she will oversee Ukraine's parliamentary election on Sunday, Irina Sobko points across a field of wilted sunflowers to a town controlled by Russian-backed rebels where she says there won't be any voting. 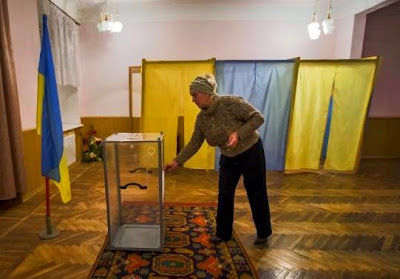 A staff member of a local community center, converted to a polling station, adjusts a number on a ballot box in the village of Novotroits'ke, south of pro-Russian rebels' stronghold of Donetsk, October 23, 2014. "We're Ukraine's last polling station, the front line, so to speak," said Sobko, 53, who is on the election committee at one of three polling stations in the pro-Kiev village of Novotroitske in eastern Ukraine. "We want to be part of Europe, and I so hope the vote will be one small step closer," she said, speaking over the clear plastic ballot boxes decorated with blue and yellow tridents, one of Ukraine's national symbols, laid out for Sunday's voters. The vote will be the first parliamentary election in Ukraine since street protests ousted former Moscow-backed president Viktor Yanukovich and replaced him with a pro-European government, plunging ties between Russia and the West to Cold War-era lows. The poll seems set to reinforce President Petro Poroshenko's position in Kiev, but it will likely deepen the divide that exists in eastern Ukraine between places like Novotroitske, controlled by Ukrainian forces, and its closest neighbor Dokuchayevsk, now in the hands of pro-Russian rebels. Ukrainian Prime Minister Arseny Yatseniuk, a hawk in Kiev's leadership, warned the country's security council this week that Russia, whom he and the West accuse of aiding the separatists with weapons and soldiers, may try to disrupt the election. Separatists are looking to hold their own elections on Nov. 3 that will select a prime minister of the self-declared republic and a lawmaking body as the separatists aim to create the trappings of a functioning government. Only about 30 km (18 miles) from the rebel stronghold of Donetsk, towns like Novotroitske and Dokuchayevsk, both of which straddle the front line, are surrounded by checkpoints manned either by Ukrainian troops or separatist fighters. When night falls the two sides exchange artillery or rifle fire, despite a loosely observed Sept. 5 ceasefire agreement. Violence has prevented some farmers from harvesting their wheat and sunflower crops, which have shriveled in the sun. Yelena Viktorovna, who works at the voter registration office in rebel-held Dokuchayevsk, says residents of the town are too preoccupied with violence to care that they cannot vote on Sunday. "No one talks about the Ukrainian elections, no one cares about them. For me personally, it would be nice for me to have some work to do, but most people just want the war to end," Yelena, 39, said over telephone, giving only her patronymic second name. Poroshenko's bloc is expected to perform the strongest out of all the competing parties. With Russian influence in the parliament virtually extinguished, he is expected to pull together a coalition from other pro-European parties including Yatseniuk's People's Front or even the Radical Party of populist Oleh Lyashko. Poroshenko hopes the support will provide him with a mandate to press ahead with his peace plan for the east. While sporadic violence has complicated efforts to hold elections in places like Novotroitske, almost constant shelling has made the very possibility of elections uncertain in a number of towns and villages, even those fully in Ukrainian hands. Ukraine's central election committee is unsure itself where the election will be held. Of Donetsk's 21 voting districts, nine are under Ukrainian control and eight are under rebel control. Who controls the remaining four and whether there is a chance of holding the vote there is still unclear. "Donetsk province is really the fly in the ointment as far as these elections go. There are districts where even the central election committee doesn't know what's going on," said Serhiy Tkachenko, chairman of the Donetsk branch of a nationwide non-governmental election monitoring group. Those places include places that are partially controlled by Ukrainian troops and partially by rebels: Horlivka, Yenakiyevo, Dzerzhinsk and Avidiyivka, which serves as a bulwark for Ukrainian troops north of Donetsk. For Valery Lubinets, who manages his son's campaign as a member of President Poroshenko's bloc in the town of Volnovakha, which lies a few kilometers south of Novotroitske, promises for additional security on election day offer some comfort. Election committees have been promised military and police protection in case of attacks from rebels. "Chances are the elections will be quiet but we've been forced to protect ourselves. Police, military will be on guard because everyone knows there is a chance an attack will disrupt elections," Lubinets said at his campaign headquarters. "Tensions have risen, the cases of intimidation, cases of sabotage, the town's election council has already been intimidated with calls telling them not to carry out their work," he said. For others however the election offers the first chance of a choice not dominated by former president Yanukovich's Party of Regions whose local and regional officials ruled party politics for years in industrial eastern Ukraine. "I'm so happy to be rid of them and have a different choice for once," said Sobko. While promises of ending corruption which has plagued Ukraine for decades may or may not be fulfilled, the pro-European leaning of most parties will make it easier for the next government to push forward on European-style reforms. The rebels themselves say that Ukraine is free to hold whatever elections it chooses and that they will do nothing to prevent the poll from taking place. The head of the rebels' election committee Roman Lyagin said, however, that no Ukrainian elections would take place on the territory of the Donetsk People's Republic. "We have no diplomatic ties with Ukraine. We are in a state of war with them at the moment so having their voting booths on our soil is impossible," he said in a luxurious office building in central Donetsk which has become the election committee's headquarters. "We have our own task which is to hold an election for the prime minister and people's council and to make those elections as legitimate as possible," he said, wearing a pinstripe suit with suspenders. In Donetsk billboards advertising the rebels' Nov. 3 election and rebel leader Alexander Zakharchenko's own candidacy are among the few signs up around the city. The rebels' Internet outlets advertise Zakharchenko's trips to meet doctors and pensioners ahead of the election which pits the former electrician turned rebel fighter against two other less well known separatists from other rebel factions. For some in the rebels' Donetsk People's Republic, the inability to participate in the Ukrainian election is a bitter pill to swallow. Vladimir Silimonchuk, 48, who works as a mining engineer near the rebel held city of Makiyivka, said he has worked at every election for the last ten years either on the election committee or as an observer. "It's offensive to not be able to vote and to have to abide the thought of rebel elections. They've been in control for six months and we have nothing, no economy, no lives, just more of their rebel flags," he said looking up at the rebel standard flying over a statue of Soviet Bolshevik leader Vladimir Lenin in a central Donetsk Square.